I've know of the period use of the "portapiece" on jacks, gambesons, cotuns, and aketons for some time now but most if not all coats I've seen for sale lack this defense to the thrust though the gap where your coat points, buckles, or laces close. Well, until Matt Cacy gack'd me though the gap 3 weeks ago with his Albion. So without further ado, a simple "portapiece". The coat turned inside out to show the added defense. Since I've never mastered a sewing machine all work was done by hand. I used a stout waxed linen leather working thread to attach the piece with a tight whip stitch. 90ish percent of the "gap thrusts" seem to flow from the right to the left so I attached the "portapiece" on the left side of the coat. If you make one to match your coat, you can just use multi-layers of linen or a padded shell. 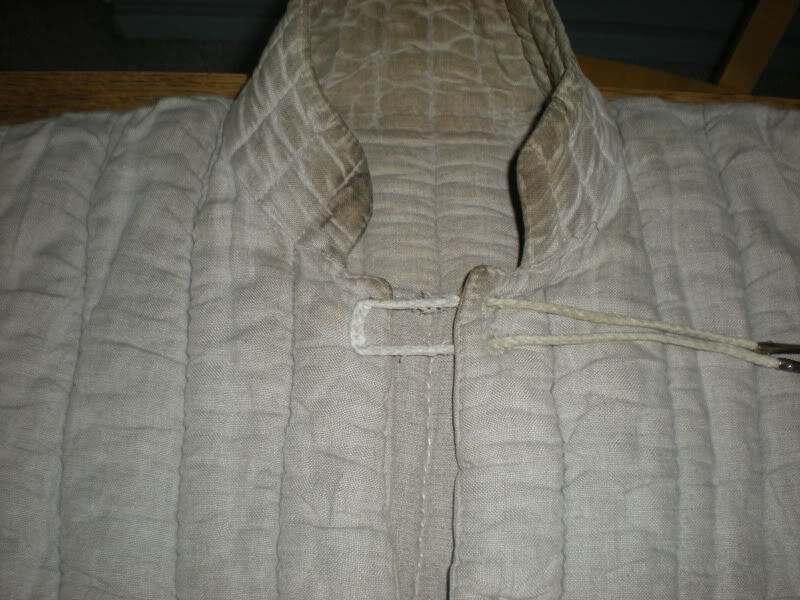 you can attach one with points on the inside of the coat, whip stitch it to the liner, button it, or attach it by matching it to a quilted seam on your coat and stitching it though all layers. Matching linen can be bought cheap on line. What the coat looks like with a matching "portapiece" from the outside. In use the coat would be pointed shut. By the way, on garments, that's known as a placket. In period text I've seen the phrase "portapiece" but it's been a few years and I don't remember the source (or maybe the correct spelling) but the modern word "placket" will do just fine.... as long as folks don't confused it with "plackard "
I just wanted to add the search word so it will be found... great pictures that show exactly what it is and why it's valuable. I'm a big fan of not getting stabbed! Simple, yet elegant solution. And sewing by hand?! Amazing, I don't have the patience for that yet. And sewing by hand?! Amazing, I don't have the patience for that yet. Ahh, yes, but willing to learn. I'm hoping come next fall to start modifying and sewing a lot more of my own stuff to bring it up to snuff. Is that your Matuls you modified or a custom one? Is that your Matuls you modified or a custom one? Matuls, but I plan on making them for all of my coats. Ah yes an important part indeed. My wife began adding them to the aketons/gambesons she makes when we saw them on several medieval examples and decided they must have put them there for a reason. Nice work Dave it looks great! On the other hand (no pun intended), I know of some people who go on sewing by hand because they don't have the patience to learn machine-sewing--especially for deeply-curved seams, where hand-sewing makes it much, much easier to control the line of stitches and notice any flaws before they propagate too far. 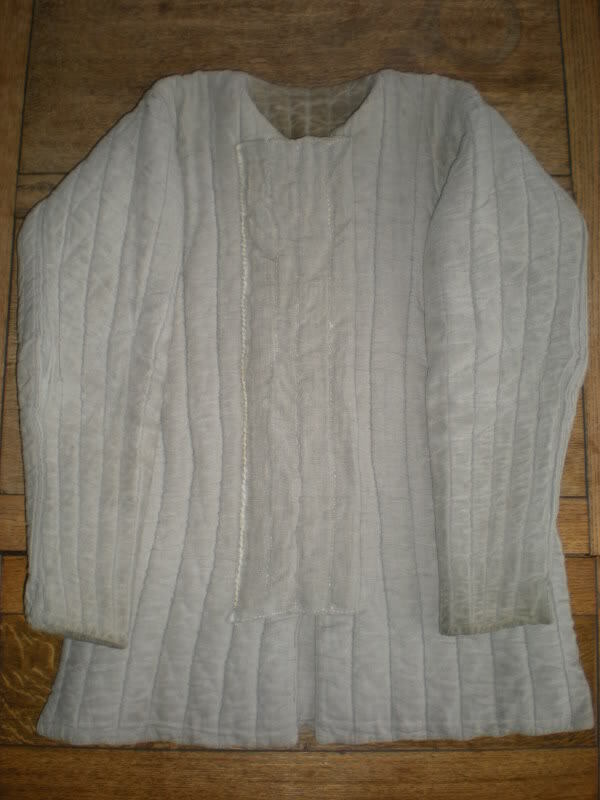 I saw a movie, albeit fantasy genre, where one of the main characters was wearing a double breated gambeson. Two panels that completely cover the torso in the front. Is there any historical evidence that such an item would be worn? It seems a good idea considering the conversation on this topic. Much later period fencing doublets. Yeah. Double-breasted padded defenses aren't really kosher for medieval Europe but they're perfectly acceptable for, say. medieval Central Asia (where it's basically just a padded version of the nomads' tunic with overlapped front) or 19th-century Europe. Hi David. I have a question about your placket. What did you use to stuff it with? Matuls shipped me some extra fabric with my gambeson so I want to make a placket myself as well. I'm working on an aketon where I'm using a bamboo batting. Though not historically accurate, it supposedly keeps you cooler, and has natural anit-bacterial fighting properties (which I like since I don't wash mine all that much). David, where did you find the cotton/silk blend? I can only find cotton, or cotton/poly blend in town. Thanks! Posted: Mon 31 May, 2010 2:16 pm Post subject: Portapeice or Plackett...Can You Hack It? Here I go again, just can't resist the temptation...keep your codpiece in place, and your portapiece around your shoulders, wear your plackett so your opponent can hackett. There, just had to get that out of my system! Though not into the fenching with longswords thing, looking at the plackett or portapiece gave me an idea for making one. 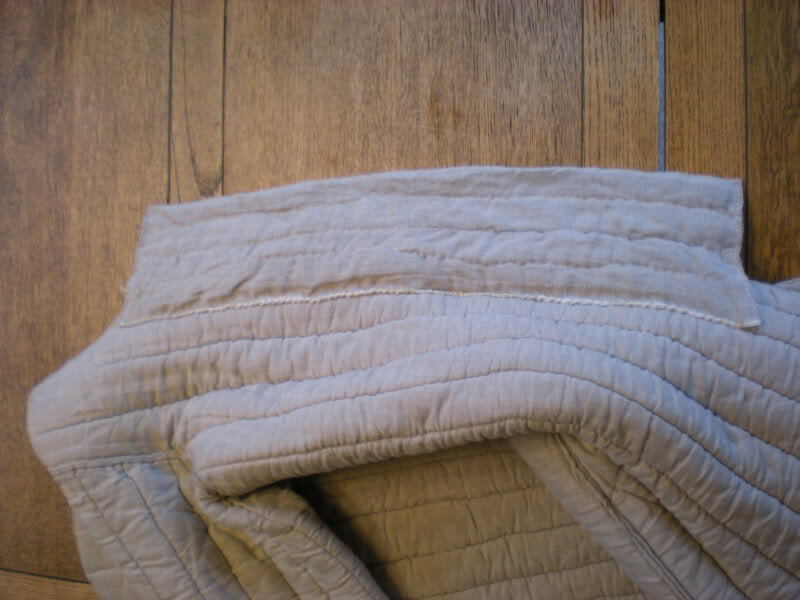 I have a movers blanket which is a rather thick padded coverlet that would be ideal for making a plackett. It would be a simple matter of cutting one up using a pattern and then stitching it together. You may consider this idea in the Public Domain since I do not intend to take out a patent for it. By the way Michael B is the resident expert on stones as extemporaneous weapons. Thanks David. I'll post pictures when it's done (It might take some time. My broken finger has healed but I need a couple of weeks of physical therapy to get the motion back). Posted: Mon 31 May, 2010 10:02 pm Post subject: Re: Portapeice or Plackett...Can You Hack It? I have been thinking about something very similar. I have found online a movers blanket, 72" x 80", 100% cotton to use as a material for a gambeson following patterns I found online. The patterns very possibly a link found here on myArmoury. My biggest concern is that, taking historical consideration, the zig-zag pattern of stitching would be out-of-place. It would, however, be an economical alternative. This movers balanket is only about $17.00. Added to my time and the challenge of a fun and interesting project peaks my interest.